A younger buyer profile is starting to figure more prominently in Dubai developers’ plans. And “co-living” spaces are what the developers are building for them where buyers and tenants could aim to live and work within the same neighbourhood. Emaar has launched the “Collective”, where one-bedroom units start from Dh671,888 at its 11 million square metre Dubai Hills Estate project in MBR (Mohammad Bin Rashid) City. The “functional spaces encourage a connected and collaborative environment that appeals to entrepreneurs, creatives, professionals and families”, Emaar said in a statement on Thursday. That’s the key point developers are driving at in their sales pitch — live and work in the same place or area. For a new crop of buyers and future tenants, this detail matters. They are not the sort who will be willing to spend hours on the road to get to work and back. These co-living spaces also score with a growing base of start-up business owners and professionals working in these. The Dubai Silicon Oasis cluster has benefited immensely from such co-living and co-working spaces as has Tecom with its Internet and Media cities and Knowledge Village. Late last year, another developer, Nshama, offered its version of a co-living project, with the UNA located at its Town Square community. 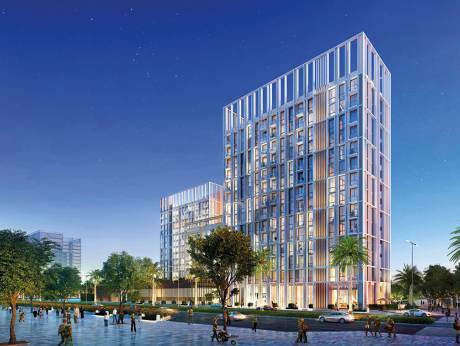 Then there is the niche development firm KOA with its Canvas project off Mohammad Bin Zayed Road, and targeting an upwardly mobile and young buyer profile. Then there is the Dubai Design District cluster, already a hot spot for millennials and which will have its own residential offerings in the medium-term. With Collective, Emaar is also going after investors who will want to pick up the units for leasing purposes. Boosting the credentials further would be the proximity to the Dubai Hills Mall, now at a fairly advanced stage of construction. There will be retail and dining options on the podium level of the Collective, which helps meet “all the needs of residents either within the building or right around the corner. This further underlines the appeal for tenancy and investment purposes,” Emaar said in a statement. While Emaar did not divulge the selling price, market sources say of the launches to date at Dubai Hills Estate, apartments have averaged Dh1,110 to Dh1,400 per square foot, while the villas command Dh900-Dh1,200 a square foot. Plus, there are the “mansions”, which are at Dh2,000-Dh3,000. Demand for the Dubai Hills Estate units have been steady, and with a spike anticipated by the time the mall gets delivered. The wider MBR City is already taking shape, with the Meydan district setting a hot pace and more developers pushing through with their projects. This includes the multibillion dirham Riviera and Victoria mixed-use clusters from Azizi.